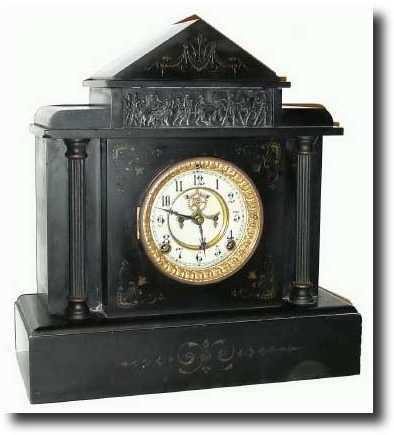 C.1904 Ansonia Clock Co., "El Dara" Black marble mantel clock This heavy clock has some chips on the top and base corners; the case is otherwise sound with incised pattern in the front, and a cast metal frieze of Roman life across the top. The dial and bezel glass are fine; enjoy this clock as is or use the movement in another Ansonia. The hands are original. Height 14"